Community Sing with Pat Cannon of Family Music Studio in Brunswick, 6-8 p.m., Raymond Village Community Church, 27 Main St., Raymond. $2 donation suggested. Sponsored by Raymond Arts Alliance. “What The World Needs Now: A Burt Bacharach Songbook,” featuring Mary Bastoni on vocals, University of Southern Maine Faculty Concert Series, 8 p.m., Corthell Concert Hall, Gorham. Tickets $15 for adults; $10 for seniors, USM employees and alumni; $5 for students at www.usm.maine.edu/music/boxoffice or 780-5555. Old-Fashioned Outdoor Band Concert, University of Southern Maine Concert Band, Corthell Concert Hall green, USM, Gorham, 1 p.m. Free. Fiddle-icious, fiddle orchestra led by Franco-American fiddler Don Roy, 7 p.m., McCormack Performing Arts Center, Gorham High School, 41 Morrill Ave. Tickets available at door, $15; children 12 and under free. www.fiddleicious.com/performances. “And Then There Were None,” 7:30 p.m. Fridays and Saturdays, 2 p.m. Sundays, Schoolhouse Arts Center, 16 Richville Road, Standish. Tickets $12, $14 at www.schoolhousearts.org. “Sister Act,” 7 p.m. Fridays and Saturdays, 2 p.m. Sundays, Windham Center Stage Theater, 8 School Road, Windham. Tickets at windhamtheater.org. “Tartuffe” by Moliere, University of Southern Maine Department of Theatre, Russell Hall, Gorham campus. $8-$16. Go to usm.maine.edu/theatre for show times and ticket information. Daniel Minter, “OTHERED, Displaced from Malaga,” opening reception 6-8 p.m. Art Gallery, 5 University Way, Gorham. Gallery Talk 6:15 p.m. Exhibition through Dec. 9. 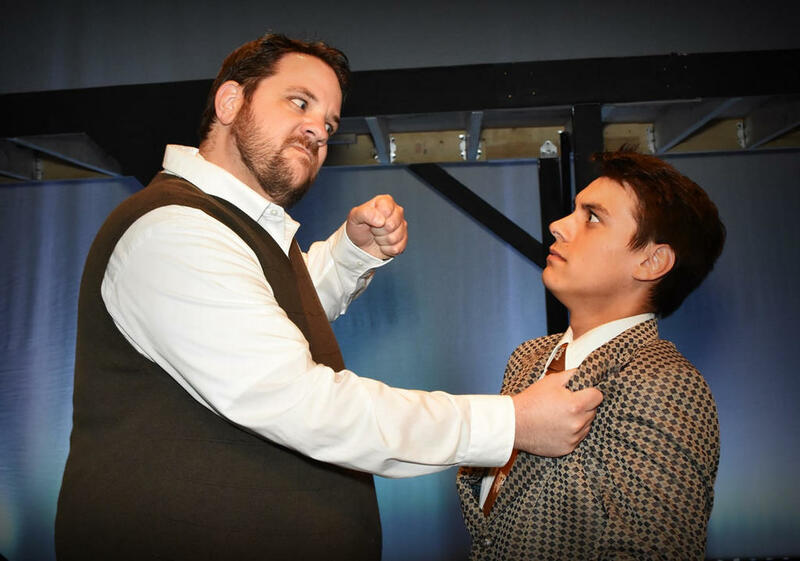 William Blore (Randy Hunt of Westbrook) threatens to throttle Phillip Lombard (Zachariah Stearn of Windham) in Schoolhouse Arts Center’s production of “And Then There Were None,” showing Sept. 28-Oct. 7 in Standish.